Awesome full sound from this classically styled, semi-hollowbody. When Leo Fender launched the G&L L-2000 bass in 1980, it was clear he was ready to make history all over again. Never before had such a wide range of tones come from a single bass, and throughout its evolution the iconic L-2000 has continued to win the hearts of bassists of every style and musical taste. Once the ASAT guitar came around in '86, it didn't take long for Leo to apply this body shape to a bass. The ASAT Bass is essentially an L-2000 packed into an ASAT body shape, with a narrower 1-1/2" nut width to help balance the instrument. The result is one the coolest looking basses ever to come from Leo Fender, with all the power and flexibility of an L-2000. Tom Hamilton of Aerosmith has been a fan of ASAT Basses since the '90s and now has his own ASAT Bass Tom Hamilton signature model. The foundation of the ASAT Bass is a pair of G&L Magnetic Field Design humbuckers backed by the flexible Tri-Tone control system, providing the sort of versatility that'll let you find your tone no matter what kind of bass line you're laying down. The Tri-Tone system features a trio of mini toggles for pickup selection, series/parallel signal routing and active/passive operation, as well as a trio of knobs for volume, treble and bass. With all that under the hood, Leo gave the ASAT Bass the kind of chops that'll fit in any situation, from classic R&B to power-packed rock to poppin' funk. What's more, the ASAT Bass features an innovative Leo Fender-designed Saddle-Lock bridge to transfer string energy right into the body end-grain for an incredibly resonant instrument. On the other end is a comfortable, C-shaped neck checking in with a modern 12" radius and 21 Plek-processed medium-jumbo nickel frets ready to deliver silky playability. 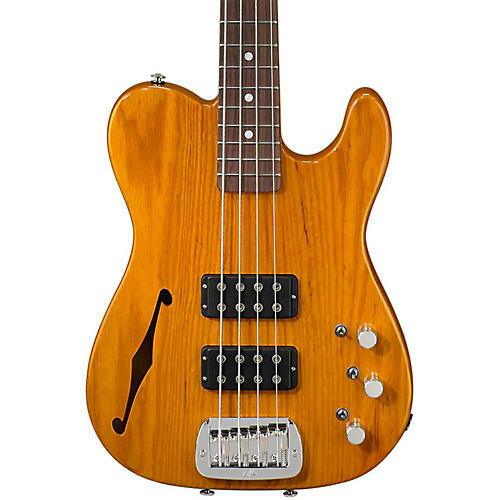 Made in Leo Fender's historic G&L facility on Fender Avenue in Fullerton, California, the ASAT Bass Semi-Hollow is available with a wide range of custom options including body and neck woods, body and neck finishes, and neck profiles.